The construction of the first of the planned total of 8.022 low-cost apartments for security sector personnel – the Ministry of Defense and the Serbian Armed Forces, the Ministry of the Interior, the Security Information Agency and the Administration for the Enforcement of Penal Sanctions of the Ministry of Justice began with the laying of foundations in Vranje and Niš. The corner stone in Vranje was laid by the President of the Republic and Supreme Commander of the Serbian Armed Forces, Aleksandar Vučić, while in Niš, this was done by Prime Minister Ana Brnabić. 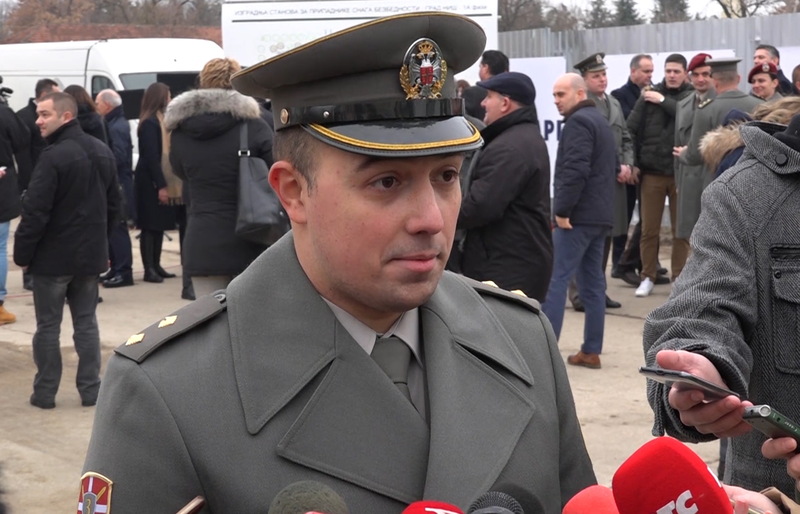 Minister of Defense, Aleksandar Vulin and Minister of Justice, Nela Kuburović attended the beginning of the construction of low-cost apartments in Niš, and the ceremony in Vranje was attended by Minister of Internal Affairs, Nebojša Stefanović, Minister of Construction, Transport and Infrastructure Zorana Mihajlović and Director of BIA Bratislav Gašić. President of the Republic of Serbia and Supreme Commander of the Serbian Armed Forces, Aleksandar Vučić, said that construction of low-cost apartments for members of security sector perspnnel is beginning today in Vranje and Niš and that he is glad that people from the Armed Forces, the Police and BIA will tie their future to the south of Serbia and Vranje, rendering us safer; we will know who protects us, who makes citizens feel safe and secure. He emphasized that in the first phase 186 apartments will be built in Vranje, and that so far money has been provided for building 8.022 apartments throughout the territory of Serbia. - This means life for more than eight thousand families. This means future for them, but also a safe future for all of us – said President Vučić, adding that apartments in Vranje will be the cheapest and that their price will be EUR 400 per square meter, with very good and quality construction and repayment period of 30 years . According to him, Vranje is not talking about the future today, she does not dream and does not imagine, but the future is literally built, and that could be seen yesterday in Vladanski Han, and today in Surdulica, Grdelica and Vranje. - We are aware how much this future depends on us, on our work, on the readiness to make it, on the amount of effort we invest in it - said President Vucic, emphasizing the importance of new investments and new factories that have been opened up to now. Recalling the past when the factories were destroyed, the cities of Serbia were left with no prospects, and the "group of political robbers" was enriching, President Vucic pointed out that the time and the future of Serbia were taken away, but now it is important that Serbia moves forward. - Serbia started to stand upright and proud just where its place is, in the future, which it builds itself first and at a time when it will be in Vranje and in Han and Surdulica, but also in Niš, Leskovac, Mitrovica, Kraljevo, Kragujevac and everywhere else to see and live a life worth living. Everything we do and everything we have done so far is dedicated to this life. To those who do not need big words, who no longer tolerate anyone lying to him, who does not have promises or empty stories, but wants someone to do it, to support him, to protect him, and to provide him with the future. Today, this is happening here and in every other city in Serbia - support for the future - work, work for the future, preservation of the future and securing the future - said President Vucic, adding that the work will be completed when the apartments are finished and when the members The army, the police and the security services have first started in 186 apartments, and then even more, when we provide cheap apartments for the young, for those who deal with science, when we allow them to be on their own, dream families, make families and work . - Let's go ahead, go to tomorrow, go and build the land of your children. We're going to the future. Right ahead - said President Vucic and thanked everyone who contributed to this project. At the ceremony in Nis, Prime Minister Ana Brnabić pointed out that today, at the same time, President Vučić in Vranje, and in Niš, on the same task - to show in another way that they care about their citizens, to care about the most important things, about what is the quality of life of our citizens, what is their standard, whether they are happy and satisfied with their families, can we do something that gives them a perspective to stay here, in Niš and Serbia. - But we are also the president of the same task today, and this is to show that we are fulfilling our promises and that our words are not empty words, that what we say, we do on it, whatever challenges we are, and that in the end it all together, we will do it for all our citizens, "said Prime Minister Brnabic. Speaking about this housing project, she pointed out that the idea was to express gratitude to all members of the security forces of the Republic of Serbia who work hardest and most dangerous jobs in one of the most concrete ways. - In the most concrete way, we thank you for the fact that you are ready to sacrifice your lives if you need to preserve our own, in order to preserve the safety of all citizens of the Republic of Serbia. And this is another way for us to say thank you very much to you and your families who also have made a great sacrifice by doing this job for your country and your citizens - said the Prime Minister. She also pointed out that these cities were chosen because members of the security forces were asked where the apartments were most needed. - In the first phase, as the president said, the total will be 8,022 apartments. In Nis, of that number, there will be as many as 2,400 apartments, and today we laid the cornerstone for 190 of those 2,400. As the president said, we are building the future of Serbia - said Prime Minister Brnabic, adding that not far from here, the cornerstone for the Science and Technology Park has recently been set up, so that Niš will become the innovation center of Serbia, the city of electronics. Prime Minister Ana Brnabić also pointed out that it was planned to complete these 190 flats and Science Parks in about the same time and invite everyone to gather at that time to celebrate it solemnly - the move of young geniuses and first families of security officers. Lieutenant Stefan Milosavljevic, a member of the Third Army Brigade, said that he did not hide the satisfaction that by constructing these apartments we will be able to make a quick and inexpensive way through the construction of these apartments members of the defense system solve the housing issue. - These apartments in Nis were built in a quiet part of the city and in a good location, and I would say, in their own behalf and on behalf of the other members of the Ministry of Defense and the Army of Serbia, that we are satisfied that the Ministry of Defense has recognized the problem of housing care of its members started to realize, and in this way we will get a roof over our heads - said Lieutenant Milosavljevic, adding that this in particular means to his colleagues who have already set up families, but also to those who will only form families.